I am a huge fan of essays. I like to use a variety of assessment in the teaching of history (newspaper articles, presentations, pamphlets, debates, ect.) but ultimately I believe that the humble essay is the ultimate arbiter of historical expression. When it comes to my top set Year 9 class they do a great job. Their essays do all the things I want. They make an argument. They use evidence. Some of them even evaluate evidence and interpretations. However, what they miss is more stylistic. They just don’t write like Historians. I know that it is a lot to ask from students at KS3 but it’s something I want to encourage. But, how can this be developed? Well here I want to look at how I have recently tried using History articles to get students to understand how Historians write and get them to engage in some historiography. With my Year 9s we are currently doing an enquiry into ‘What was the most significant turning point in the Second World War?’ Initially we looked at the early stage of the war and Britain’s general lack of success. From this we then moved to our first ‘turning point’, the Battle of Britain. 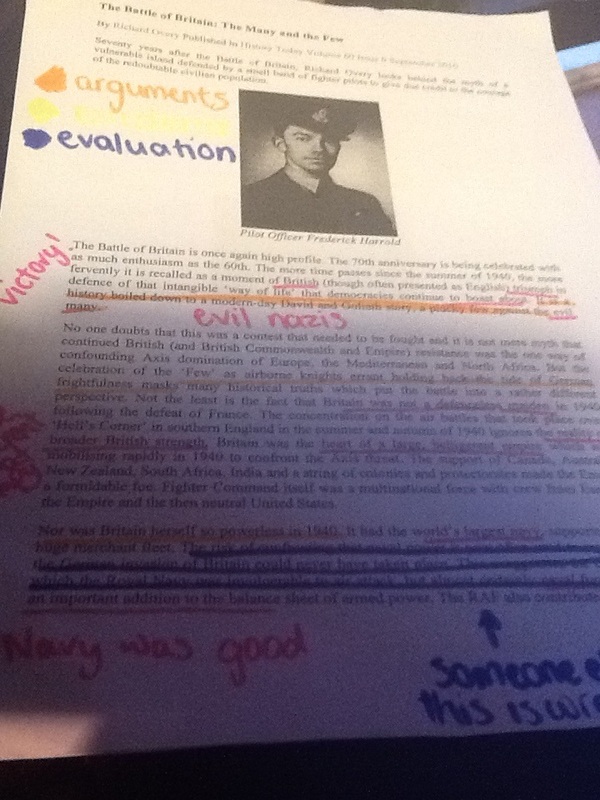 In investigating the Battle of Britain I attempted to develop the class’ basic understanding of the Battle of Britain. We looked at different ideas around why Britain was able to ‘win’ and then whether this constituted a turning point. Off the back of this I gave my students a journal article from History Today to read as homework. I asked them while reading this article to identify key arguments that it presented. On arriving to their lesson the following week the students brought their articles. Most of them had already done a good job reading these, bringing along highlighted and annotated articles. As is often the case some of my students had not read the article. Although following some passed experience with flipped learning I had anticipated this may be the case. 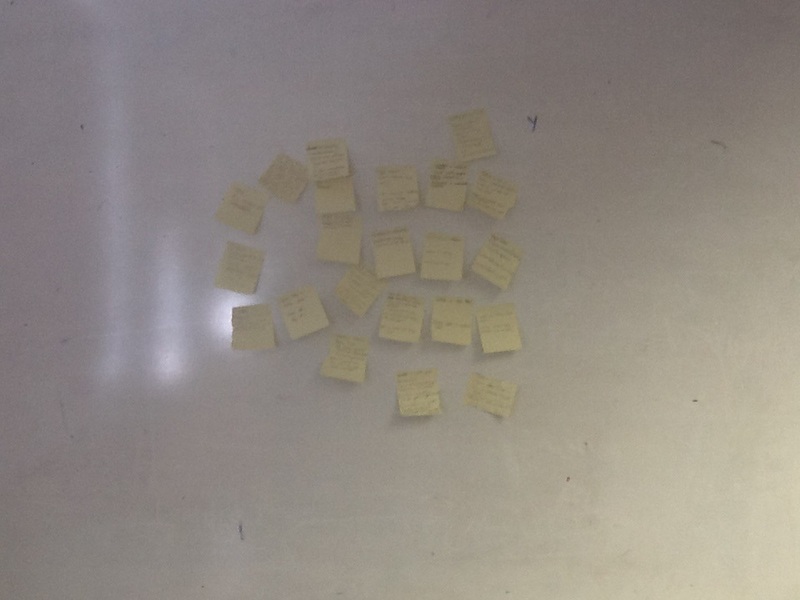 In order to draw out the key arguments of the article I asked each student to write on a post-it note the argument presented in the articles and stick these on the board. I gave the students a couple of minutes to talk about this first and read over their articles. This also gave those students who hadn’t done their homework time to catch up. I then selected a few post-it notes and read these out. For each one I asked the class from some evidence used to support these arguments in the article. From this I hope to get students thinking about how the argument was being constructed. The British were a lot stronger in the Battle of Britain than is often suggested. The ‘many’ civilians suffered significantly more than the ‘few’ of the RAF. Anticipating these interpretations I placed the interpretation, that ‘the ‘many’ civilians suffered significantly more than the ‘few’ of the RAF’, on the board and got the students to discuss some questions related to this. I deliberately designed these questions to be more like broad prompts for discussion than specific questions to be answered. As educated adults we find it very easy to hold free and open discussion with each other and construct our own scaffolds to do this. However, for our students it is often necessary for us to provide a scaffold. Nonetheless, to be true to the nature of scaffolding we need to ensure that scaffolding is being removed. Therefore here I wanted to just give the students some prompts for discussion. This really created some debate from the class and allowed them the opportunity for some initial reflection on how Historians construct arguments. The main part of the lesson now involved the students reading the article again. However, I now wanted them to draw on some of their thinking and to structure their reading a little more. For this I asked them to highlight their articles with three different coloured pens as Argument, Evidence and Evaluation. Following this student feedback examples. As you can see in the example above the students went through this reading very methodically. This was a big improvement on their initial notes in which they highlighted anything and everything. Finally building on the class’ feedback we had a discussion about the process. With this high ability group we were able to have some really interesting discussions about how Historians construct their arguments. We were also able to discuss how this article could be used in their own essays. The student’s suggestions ranged from using some of his evidence and statistics or evaluating the argument he proposes. I really enjoyed this lesson and was really impressed with the class. They worked very well on these tasks and seemed engaged by the ideas of interacting with the work of Historians. Although I have only used this with a top set group I believe that some of the same principle can be applied to all groups, although scaffolding being needed. I would however say that the impact of setting the article as homework was limited, although it did give them a bit of time to reflect on it. However, after going through the process of reading the article with them I am hoping that in the next article I set them they will be able to put these principles into practice (I will let you know). My next step is therefore going to be to give my students some more articles to read but remove the scaffold which I provided in this lesson. Ultimately this will build up to the students comparing two articles on D-Day. My aim is that by reading these articles students will gain an insight into how Historians write, which will ultimately develop their own writing. Through a few other activities I also want to see my students using these articles and evaluating their arguments in their own essays. Overall, then I think there is a lot we can do with getting more reading into the History classroom. In this there is some great opportunity for some cross-curricular cooperation with the English department. Following this lesson I paid a visit to one of my English colleagues to get an insight into how the English department gets students to engage with reading. Some great ideas have come from this and I have a few more ideas which I am sure will be part of some upcoming articles. Thanks for reading and please let me know if you have some ideas. In answering this question students need to engage with the idea of ‘significance’ and ‘turning points’. They should also take a look at different interpretations presented in these articles and critically evaluate them to develop their own judgement.